Manual pocket sharpeners have met their match with the new Guided Field Sharpener from Work Sharp. Previously limited to a hand held belt sharpening system, Work Sharp has branched out this year to add a variety of products to quickly get a great edge on your tools. 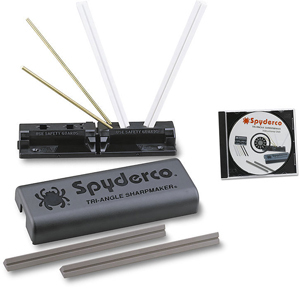 The new field sharpener includes two diamond plates (one coarse, one fine) which are held in place by a pair of strong magnets but can easily be removed for cleaning. The large ceramic rod allows one to touch up not only knives but it has a groove cut in for fish hooks that can be accessed by rotating the red knob on the end. Another feature you don’t see on many hand held sharpeners is the leather strop opposite the ceramic rods. 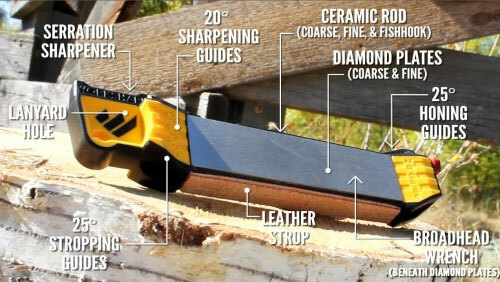 Stropping a readily sharp blade polishes up the edge by straightening out the burr which not only makes for a sharper edge but also a more durable one. The Guided Field Sharpener is a very easy to use tool (set up for both 20° and 25° edge angless) and can sharpen almost anything you throw on it. Check out this awesome new sharpener at www.knifecenter.com. Benchmark Knives is an old name in our industry… it was where most of us first encountered Blackie Collins and his amazing innovations to man’s oldest tool. 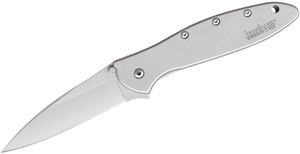 The latest incarnation of Benchmark Knives stays true to that innovation by offering a ceramic material blade in a sleek aluminum handle, all at a truly affordable price. This is a gentleman’s knife that has 10 times the edge holding capacity of a traditional metal blade-and it weighs less! Everyone should have at least one ceramic knife in their kitchen, as they are your best bet for everyday cutting chores. Ceramic knives will never corrode, they can go in the dishwasher, and they stay sharp 10 times longer than a metal blade. You shouldn’t torque them, or cut anything that might chip the edge… but if you can slice it, you’ll love doing it with a ceramic blade! The Cera-Titan series from Boker features the title Cera-Titan titanium alloy. Cera-Titan is a titanium alloy with capabilities similar to ceramics, but easier to sharpen and without the brittleness. 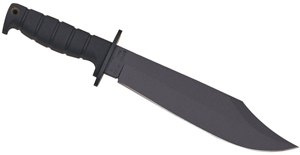 Tests have shown that the Cera-Titan metal is not only much lighter than steel, but that it also keeps an edge longer than high quality Solingen, Germany and Seki, Japan steels. It is also 100% corrosion resistant. The Cera-Titan blade is complemented with an exotic Ziracote wood handle. The light weight, combined with the slim profile, allows precise control for the skilled user. The Cera-Titan utility knife, the first model to arrive at the Knife Center, particularly benefits from this thin profile, which grants more versatility in cutting soft skinned fruits and vegetables, such as tomatoes, without squishing them.